Summer is almost over, and school will soon be back in session, so I’ve decided to come up with a list of 5 things I need to experience before this summer slips away. This weekend is actually the Summer Sidewalk Sale, which happens to be the first thing to check off on my list. I’m a big fan of shopping, so when there’s a sale going on I can’t pass it by. I’ll be spending this weekend strolling around downtown checking out the best deals going on in some of my favorite businesses, and exploring some ones I’ve never been into. I’ll for sure be heading straight to Common Era to see what fun new clothing items they have out, and then to Shoe Fly to scope out some shoes. I’m sure my day of shopping won’t end there because there are over 65 participating businesses in the sale this weekend (check out the full list at BoulderSidewalkSale.com). The second event on my list is to attend a comedy show at the Bohemian Biergarten! I have a friend who has gone to almost every Sunday evening show this summer. Although I haven’t managed to make it out myself, I’ve decided I need to dedicate one of my lazy Sunday nights to find $5 to get into Biergarten, and finally witness one of these entertaining comedy shows. I’ve always been a lover of a quality happy hour, but usually end up at the same restaurants. One bar that I’ve heard great things about and has always caught my eye is The Bitter Bar. I feel like this bar has such swanky vibes that I need to go and experience it. After checking out the happy hour menu I’ve decided that one day I’ll head over and order a “kiss the sky” cocktail (gin, domaine de canton, lavender syrup, and lemon), as well as one of their cheese boards. Then I’ll bask in my extreme classiness and feel accomplished that I’ve tried out a new place. The last Bands on the Bricks is happening on August 8th, and I’m making sure that I’ll be there. I couldn’t imagine a better way to end off an amazing summer of Bands on the Bricks than rocking out with That Eighties Band, I mean who doesn’t love a good 80’s classic? Plus this band was named the “top cover band in Denver” by CBS! So I’ll be grabbing one last Rio marg on the bricks to say sayonara to the Bands on the Bricks season. 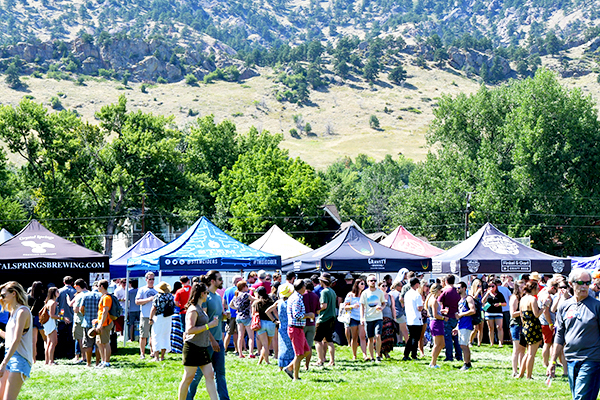 The final event that will REALLY bring my summer to an end is the Boulder Craft Beer Festival. Throughout this summer I’ve been able to get to know more about all the breweries that will be there and all the fun activities that happen all in just one day! I’ve never been a huge beer fan, but I can honestly say now after checking out some of Boulder’s best breweries I’m really starting to appreciate a good brew. To get myself ready for this festival I’m going to check out some spots on the Boulder Beer Trail to give my taste buds a little preview! Although I’m sure there are many other amazing events to do in Boulder, that I’ll probably end up adding to my list, these have to be my top 5 at the moment that I must do before it’s time to get back to the books.